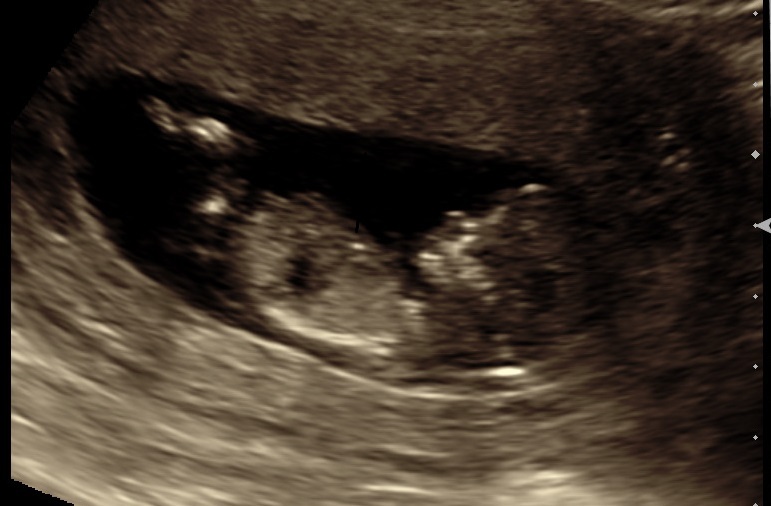 Well, hello there, unintentional month-and-a-half blogging hiatus. February was rough, yo. I think I was sick for the last month and a half, which isn’t pleasant in the best of weather. But here north of Boston, we have many feet of snow, which has pulverized our public transportation system (aka how I get to work every day). Not feeling well + commuting for several hours a day on crowded trains with cranky fellow commuters has left me very tired at the end of the day, so much so that crafting hasn’t been my number one priority. To be completely honest, most nights I watch Jeopardy and then go to bed. 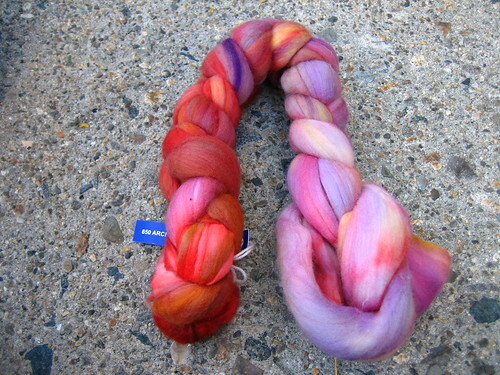 I did spin a little, turning this delicious Malabrigo Nube braid into 324 sproingy yards of delicious sport-weight yarn. The braid itself wasn’t the easiest spin. The fibers seemed very compacted, so it was difficult to pull apart and each piece needed to be fluffed a bit before spinning. 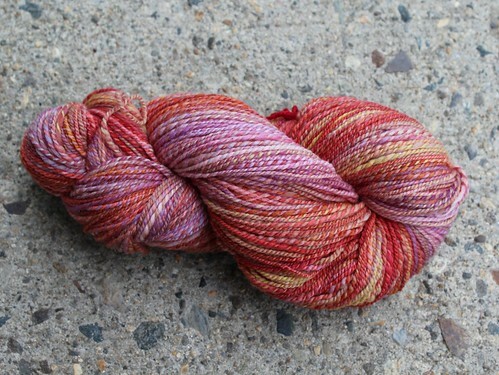 I was going for a slightly thicker spin (than my usual super thin) and I’m very happy with the finished product. But! It is now March! We’ve gotten through yet another February and Spring, the most wonderful season, approaches! Already the light is returning and days are noticeably longer. Now for temperatures to rise above freezing and the snow to melt (also, for the storm scheduled to dump more snow on us tonight to not dump as much snow as predicted). And it being March means that the wedding of my dear friend S is a little over two months away, so I better bust a move on the HST Chuppah. Today, I sewed all the HSTs and started trimming. I’d really like to finish this top by the end of the month, so for a bit of motivation, I’m making this my March ALOYF goal. Here’s the thing about knitting. 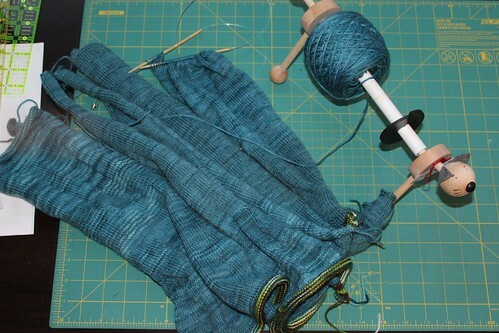 It’s great for the knitter/blogger and less interesting for the reader. I’ve been knitting like a beast over the past few days. I churned out the first sweater sleeve over the weekend (hello, football games) and am making strides down the second one. The front and back are done. I may have a sweater sometime while it is still winter. All this is super exciting for me but less exciting for you, because the sweater currently looks like this. Oh yeah. Super interesting, right? A bunch of teal knit tubes. But they’re both coming along and soon, I’ll have actual items to show. And they’re both WIPs, so I’m linking up with WIP Wednesday at Freshly Pieced! My best friend Steph is getting married in May. She and her fiancee are Jewish and will be getting married under a chuppah, which she asked me to make. 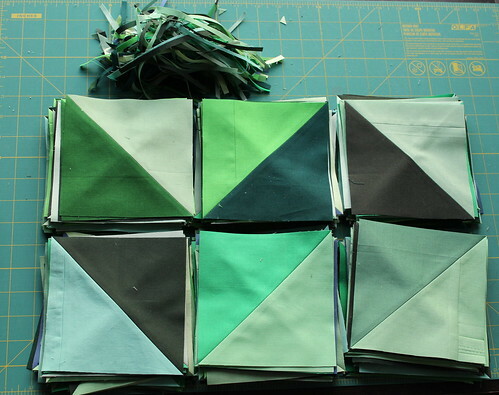 After the wedding, I’ll turn the chuppah into a quilt They’re getting married at an arboretum and both favor greens, so I’m using a Kona Solid Fat Quarter Bundle in Farmer’s Market with 23 green FQs and they’d like a modern half square triangle (HST) similar to Shards by A Cuppa and a Catch Up. They’d like the finished chuppah to be around 6′ square. 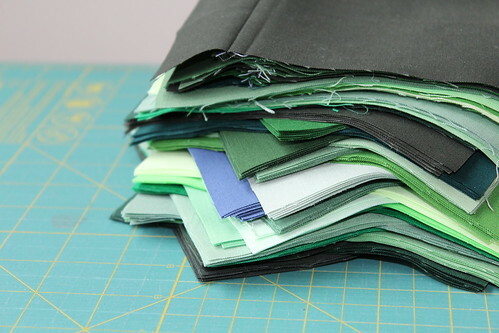 Since I don’t think a heavy quilt might not be the most ideal chuppah, I’m planning on sewing a plain, solid back and then doing some minimal straight-line quilting to keep the two layers together for the wedding. I’ll use my old machine for this, as unpicking the quilting will be REALLY easy, as after the wedding, I’ll add a border, batting, and a fun back to make it queen sized. I’ve decided the finished chuppah will be 75″ x 75″. 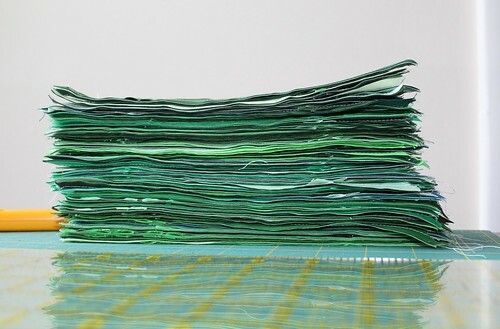 If I aim for a 5″ finished HST (5 1/2″ with seam allowance), that will be 15 x 15 HSTs for a total number of 225 HSTs. If I need each HST to be 5 1/2″ finished, the original square has to be 6 3/8″ (I’m using this HST tutorial from Blossom Heart Quilts). 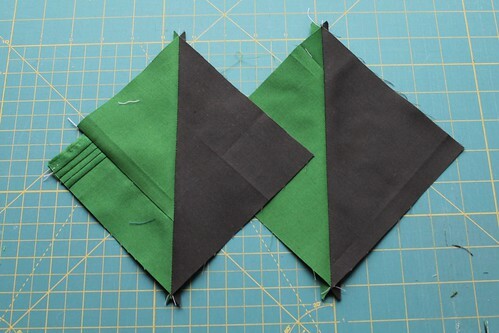 I can get 9 squares this size from a FQ (with judicious cutting and piecing), which means I need 25 FQs. 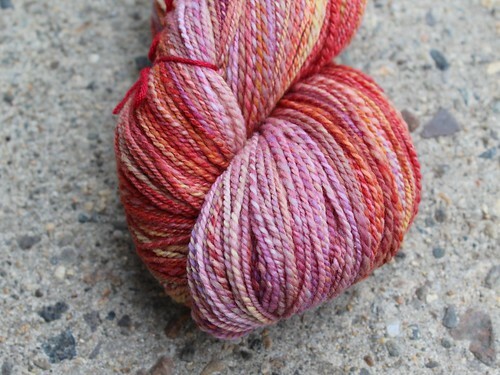 I’ll use the 23 from the bundle and add a grey or brown neutral and another solid (Kona Aloe or Cadet) from my stash. So this plan is all well and good until I started cutting. I can easily get eight squares from a FQ with minimal piecing. 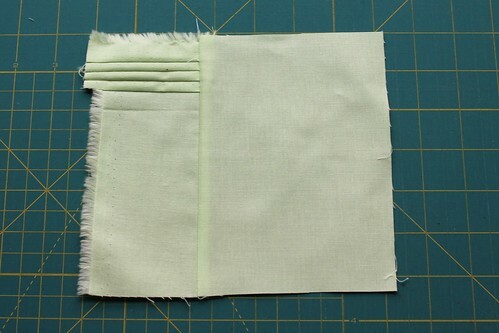 But that ninth square requires the selvage bits to be sewn to one end to make it incrementally longer. I keep telling myself that it will add a bit of texture to the top. Here’s two untrimmed HSTs. 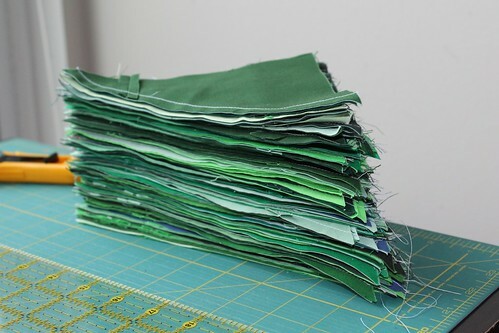 The one with the pieced side will be 5 1/2″ when trimmed, but barely. 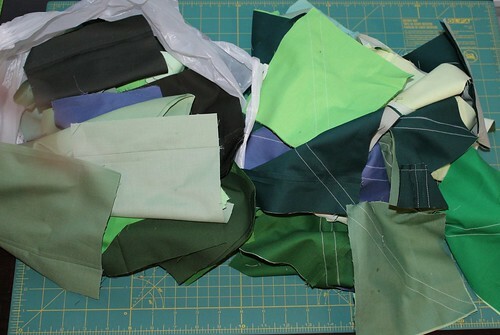 And a couple scraps for other colors aren’t big enough to piece, so I’ll have to swap them for Cadet or Aloe. I’d like to finish the chuppah by the end of the month (I think it would ease the brides’ minds knowing that their chuppah is done! ), so I’m making this my ALOYF Jan 2015 goal. Boom.